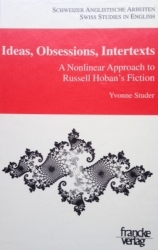 The following list of Russell Hoban-related books, magazines and other publications is based largely on the bibliography section of Dr Yvonne Studer's critical work . Links are provided to the few items known to exist on the internet, but most appear to be available in print only. Many thanks are due to Dr Studer for kindly supplying this list and letting us reproduce it here. Michel Bodmer. “A Conversation with Russell Hoban.” Private interview. Zürich, 10 November 1983. David Brooks. “Russell Hoban. An Interview Conducted by David Brooks in Adelaide on 5th March 1984.” Helix 21-22 (Spring 1985): 71-85. Ned Chaillet. “Strange Sacraments.” Time Out 2 to 8 April 1986: 95. John Haffenden. “Russell Hoban.” Novelists in Interview. London: Methuen, 1985. 121-144. Alex Hamilton. “Maps of Chaos.” Guardian 24 March 1975: 8. Valerie Jenkins. “Happiness Is a Second Family that Talks to You.” Standard 30 March 1979: 1. Paul Kincaid. “The Mouse, the Lion and Riddley Walker.” Vector 124/5 (l984): 5-9. John McEntee. “The Craftsman who Makes Novels.” Irish Press 26 April 1977. Edward Myers. “An Interview with Russell Hoban.” Literary Review 28. 1 (1984): 5 16. Paul Shand. “That’s the Way to Do It.” City Life [Manchester] 7 to 21 February 1986: 36-7. Philippa Toomey. “An Explorer who Maps the Continents of His Imagination.” Times 15 November 1974: 20. Alvarez, A. “Past, Present, & Future.” New York Review of Books 19 November 1981: 16-8. Anonymous. “In Jugular Vein.” Times Literary Supplement 29 March 1974: 345. Anonymous. “Paperbacks: New and Noteworthy.” New York Times Book Review 22 August 1982: 31. Anonymous. “What Toys Endure.” Times Literary Supplement 3 April 1969: 357. Bailey, Paul. “Unwisecracks.” Observer 16 August 1987: 23. Bell-Villada, Gene H. “A Narrative Still-Life.” Commonweal 7 October 1983: 538-540. Bowers, A. Joan. “The Fantasy World of Russell Hoban.” Children’s Literature 8 (1980): 80 97. Branscomb, Jack. “The Quest for Wholeness in the Fiction of Russell Hoban.” Critique 28.1 (Fall 1986): 29-38. Butts, Dennis. “Riddley Walker and the Novels of Russell Hoban.” Use of English 33.3 (Summer 1982): 20-27. Cowart, David. “The Terror of History: Riddley Walker.” History and the Contemporary Novel. Carbondale and Edwardsville: Southern Illinois University Press, 1989. 83-105. Cunliffe, Marcus. The Literature of the United States. Fourth Edition. London: Penguin, 1986. DeMott, Benjamin. “2,000 Years After the Berstyn Fyr.” New York Times Book Review 28 June 1981: 1-25. Dewey, Joseph. In a Dark Time: The Apocalyptic Temper in the American Novel of the Nuclear Age. West Lafayette, Indiana: Purdue UP, 1990. Dipple, Elizabeth. “Russell Hoban: This Place Called Time.” The Unresolvable Plot. Reading Contemporary Fiction. London: Routledge, Chapman and Hall, 1988. 160-181. Dorris, Michael, and Louise Erdrich. “Bangs and Whimpers: Novelists at Armageddon.” New York Times Book Review 13 March 1988: 1, 24-25. Dowling, David. Fictions of Nuclear Disaster. London: Macmillan, 1987. -----. “Russell Hoban’s Riddley Walker: Doing the Connections.” Critique 29.3 (Spring 1988): 179-187. Granofsky, Ronald. “The Contemporary Symbolic Novel.” Dissertation Abstracts International 47.2 (Aug 1986): 526 A. Gray, Paul. “Shell Games.” Time 16 February 1976: 72. Herkommer-Körfgen, Barbara Maria. Das Muster in Bewegung. Die Romane Russell Hobans. Bern: Peter Lang, 1994. Hildick, Wallace. “Few Laughs.” Listener 6 November 1969: 640-642. Horne, Philip. “Maids.” London Review of Books 1 to 20 April 1983: 14-15. Korn, Eric. “A Map of the Underground.” Times Literary Supplement 4 September 1987: 949. Lake, David. “Making the Two One: Language and Mysticism in Riddley Walker.” Extrapolation 25.2 (Summer 1984): 157-170. -----. “Riddley Walker. Pilgermann.” Foundation 29 (November 1983): 96-98. Lehman, David. “Pilgrim’s Progress.” Newsweek 30 May 1983: 92. Lively, Penelope. “Five of the Best.” Encounter 56 (January 1981): 58-59. MacKillop, Ian D. “Russell Hoban: Returning to the Sunlight.” Good Writers for Young Readers. Ed. Dennis Butts. St. Albans: Hart-Davis Educational, 1976. 57-66. Maclean, Marie. “The Signifier as Token: The Textual Riddles of Russell Hoban.” AUMLA 70 (Nov 1988): 211-219. Maynor, Natalie, and Richard F. Patteson. “Language as Protagonist in Russell Hoban’s Riddley Walker.” Critique 26.1 (Autumn 1984): 18-25. -----. Postmodernist Fiction. New York: Methuen, 1987. McMahon-Hill, Gillian. “A Narrow Pavement Says ‘Walk Alone’: The Books of Russell Hoban.” Children’s Literature in Education 20 (Spring 1976): 41-55. Meyer, Thomas. “You remember?” Tages-Anzeiger (Zürich) 26 October 1994: 85. Morrissey, Thomas J. “Armageddon from Huxley to Hoban.” Extrapolation 25.3 (Fall 1984): 197-213. Mustazza, Leonard. “Myth and History in Russell Hoban’s Riddley Walker.” Critique 31.1 (Fall 1989): 17-26. Porter, Jeffrey. “‘Three Quarks for Muster Mark’: Quantum Wordplay and Nuclear Discourse in Russell Hoban’s Riddley Walker .” Contemporary Literature 31.4 (Winter 1990): 448-469. Punter, David. “Essential Imaginings: the Novels of Angela Carter and Russell Hoban.” The British and Irish Novel since 1960. Ed. James Acheson. New York: St. Martin’s Press, 1991. 142-158. Sage, Lorna. “Doodles from the Oracle.” Times Literary Supplement (10 April 1992): 20. Schwenger, Peter. “Circling Ground Zero.” PMLA 106.2 (1991): 251-261. -----. Letter Bomb. Nuclear Holocaust and the Exploding Word. Baltimore: Johns Hopkins University Press, 1992. -----. “Writing the Unthinkable.” Critical Inquiry 13.1 (Autumn 1986): 33-48. Shippey, Tom. “Fun with Flickers.” Times Literary Supplement (8 March 1996): 24. Swanson, Roy Arthur. “Versions of Doublethink in Gravity’s Rainbow, Darkness Visible, Riddley Walker and Travels to the Enu.” World Literature Today 58.2 (Spring 1984): 203-8. Taylor, Nancy Dew. “‘... you bes go ballsy’: Riddley Walker’s Prescription for the Future.” Critique 31.1 (Fall 1989): 27-39. Thornber, Robin. “A Bomb in the Myth of Time.” Guardian 20 February 1986: 10. Thwaite, Anthony. “Bad Time and After.” Observer 19 October 1980: 28. -----. “Chapters of Accidents.” Observer 24 March 1974: 39. -----. “Fathers and Sons.” Observer 1 April 1973: 37. -----. “Pilgrim’s Progress.” Observer 13 March 1983: 33. Tonkin, Boyd. “Notes from Underground.” New Statesman 14 August 1987: 27. Traugott, Maggie. “Hoban’s Choice: a Bit Grimm.” Independent on Sunday 3 May 1992. Waugh, Auberon. “But First, Life with the Lions.” Spectator 10 March 1973: 301-2. Weart, Spencer R. Nuclear Fear: A History of Images. Cambridge, Mass. : Harvard UP, 1988. White, Edmund. “Turtle Diary by Russell Hoban; Getting Into Death by Thomas M. Disch.” New York Times Book Review 21 March 1976: 6. Wilkie, Christine. Through the Narrow Gate. The Mythological Consciousness of Russell Hoban. London; Toronto: Associated University Presses, 1989.